"Yeah, we've been squatting here for a few months now." This joke, from ten years ago, is clearly a "play on words" gag. I used to do a lot of puns and word-play gags back then. I do fewer of them now, though if I think of one that seems original I'll still run with it. 2. An astronaut who "needs his space"
6. A cyclops baby who has "got his father's eye"
For less common but still fairly popular jokes, see also NHS Very Direct, cats "landing on their feet", Gulliver's travellers cheques etc etc. If you've got any more, add them in Comments below. 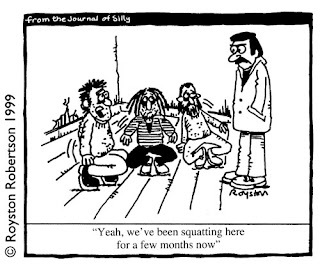 The squatting cartoon appeared in Modern English Teacher magazine in 1999. The editor had seen it in the Journal of Silly, hence the strapline at the top. They did pay me for re-using it though, unlike JoS which was a small-press mag chock full of gags and offered only exposure. Normally such offers are best avoided but the JoS was quite widely seen and was great for those of us who were starting out at the time. 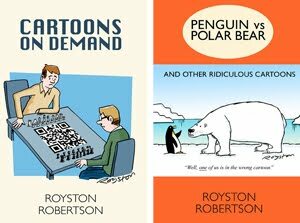 Gee whiz, Royston, how much time do you have? There are way too many -- and some are shameless. My favorite (i.e. worst pun ever) cartoon depicts a couple of vultures who are bringing their bags with them as they board the airplane: it's carrion luggage. Get it? "Carry on" and "carrion." GROOOOOAAN!!! I first saw this as a one-off gag in Mike Peters' MOTHER GOOSE & GRIMM strip, but have seen it since. Dammit Royston that's half my bloody gag collection right there. Shame on me. Haven't heard that one before, Shug. Nicely executed. Mike, that one's a clasic pun: it makes you cringe but it's also pretty funny! Steve, I'm not trying to shame anyone, most cartoonists do dodgy puns from time to time. Jason, thanks. Er, I think. Love the gurning one, Tim, but the other one may be a pun too far!